Scroll down the page to see the original version, as printed. New Zealand’s first high-power wireless or radio-telegraph station at Awanui, near the North Cape, has just been completed. Only two other similar stations exist in Australasia, namely, one at Pennant Hills, Sydney, and the other near Perth, West Australia. Thus has been added in this country one of the last links to the chain of wireless stations around the world. 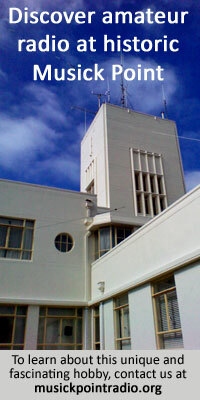 When New Zealand has its second high-power station at the Bluff and low-power stations at the Chatham Islands and Rarotonga (together with that already working on Tinakori Hills, Wellington), the Dominion will be well-equipped in the matter of wireless, and will be able to communicate with steamers possessing the apparatus in their lonely voyages across the Tasman and South Pacific Oceans. The Australasian Wireless Company secured the tender for the construction of New Zealand’s two high-power stations. Mr Eugene Reinhard, who is well known in Europe as a wireless engineer, has been engaged by the Australasian Wireless Company to superintend the installation of the stations at the North Cape and at the Bluff. Having completed the northern station, Mr Reinhard is now in Wellington on his way to supervise the work already going on at the Bluff. The tower, or mast, from which the aerials are stretched is a structure 400 feet in height. It is triangular in shape, and the material, of which it is built is mild steel. It rests on a ball and socket point, thus enabling the tower to swing slightly in a gale without danger of being blown down. The whole structure – tower, ball, and socket joint – rests on glass insulators. The insulators disconnect the tower electrically from the ground. The tower, which is 60 tons in weight, is kept in position by three double guys or stays, which are anchored in three big concrete foundations, each weighing 150 tons. These guys are also insulated from the ground. The tower is so constructed as to enable a man to climb to any part of it by means of a ladder, which extends from the ground to the top of the tower. The towers on the wireless station on Tinakori Hills are only 150 feet in height. That at Awanui is 400 feet high. To the top of the tower aerial wires are attached, which radiate like the ribs of an open umbrella, the tower being the handle. At the Tinakori Hills station there are two masts, the aerial wires being stretched between them. The umbrella-rib-like wires at Awanui run directly from the top of the tower to the ground, and about a third of each wire is operative— the rest of the wire being simply used to stretch out the upper and operative section. All the wires meet at the top of the tower, and are led down to the operating room, 400 feet below. There are also two separate smaller aerials, which are used for short distances and at night time. These also are connected with the operating room. The tower itself and each aerial are protected against lightning. Over the ground surrounding the station there is a network of wires, mounted on poles, and about 15ft above the earth – extending over a circle about 600 yards in diameter. This is called a counterpoise, and ensures a good connection to the earth. The necessary electrical energy is derived from a 70 horsepower oil engine, which drives an alternating current dynamo. The dynamo at the Wellington low-power station develops some 5 horse-power. The only other 70 horse-power engines are at the wireless stations at Pennant Hills, Sydney, and at Applecross, Perth, Western Australia. It may be explained here that the power plant is only used for sending purposes. The electricity from the dynamo is conveyed along underground cables to a separate building, in which is situated the operating room and the high-tension room. In the operating room there is a switchboard, on which are the necessary instruments, by which the operator can regulate the strength of the current, and distribute it. By passing through a transformer, the tension is increased to a very high voltage, which charges a battery of Leyden jars. These Leyden jars are connected with the aerials. Upon the jars discharging, there is caused an electrical vibration to be set up in the aerials, which then radiate waves all round in much, the same manner as the widening rings on the surface of a pond when a stone has been thrown into it. The discharge of the Leyden jars is controlled primarily by a small Morse telegraph key, and this enables the waves to be sent out in dots and dashes, according to the Morse code. All the sending apparatus is placed in a separate room, in order to guard against fatal or serious accidents to persons touching the wires, etc. The receiving apparatus, which is very small in quantity and dimensions, is also placed in the operating room. Within a few seconds any wavelengths may be picked up and duly recorded by the operator. The signals are received by means of a telephone, but provision is made so that the recording and calling-up apparatus may be attached. The wireless stations at Sydney, Fiji, Macquarie Island, Melbourne, and Brisbane have all been “spoken” with ease by the Awanui station. The conditions for transmitting and receiving are very much more favourable at night than in the day time. The reason for that is the extraordinary power exercised by the sun on the electrical waves. It is very noticeable that directly the sun sets, the signals become much stronger, and increase in power towards midnight. An additional proof that the sun has a direct influence on the radiation of the electrical waves has been furnished in the case of an eclipse of the sun. During an eclipse the strength of the waves increases in a most marked degree.